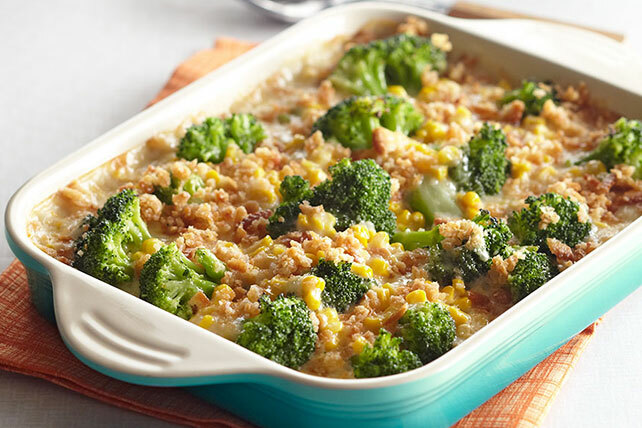 Silky cream sauce, savory cheese, flavorful vegetables and crunchy topping make this corn and broccoli casserole a delicious way to cozy up to the table. Place broccoli in 12x8-inch baking dish; top with sauce. Melt remaining butter; mix with remaining cracker crumbs. Sprinkle over sauce. This vegetable side dish makes a good accompaniment to grilled meat and fruit salad. Assemble recipe as directed. Refrigerate up to 24 hours. When ready to serve, bake, uncovered, in 350°F oven 45 min. or until heated through.